KICKAPOO—Things have been slowly building at Kickapoo the past few seasons. You just knew as you watched this current crop of seniors the past few years that something big was on the horizon. Well here we are, and the Chiefs are as loaded as any team in recent memory. Kickapoo return fully intact, and will be led by four returning senior starters in Tyson Batiste (a University of Arkansas-Little Rock commit), Ryan Burland, Matthew Ridder, and Jack Simpson, as well as junior returning starter Isaac Johnson. The Chiefs, 21-6 a year ago and Ozark Conference co-champions with Waynesville, are currently ranked #3 in Class 5, and are currently 4-0, with all four victories coming over Arkansas opponents, including a 65-62 win over defending Class 6 state champion Jonesboro (Ark.) last weekend at the Ozark Mountain Shootout. As if the talent on the starting five is not enough, there will be plenty of depth provided by a JV team that went 21-0 last season. District realignment leaves the Chiefs as the clear favorite in Class 5 District 11. WAYNESVILLE—The Tigers, 24-3 last season and 8-1 co-champions with Kickapoo, bring just two starters back, but one is really good (junior guard Joe Johnson) and the other may be the best player in the entire state in All-Everything senior Juwan Morgan, a 6’8” senior who has already committed to play at Indiana. The Tigers will need to plug in some holes due to graduation losses, but Waynesville will be in the mix for a conference (and state?) crown by February. PARKVIEW—The Vikings’ record a year ago was nothing spectacular, as Parkview finished the season at just 14-12, and a disappointing 4-5 in the conference after four-straight 7-2 efforts. However, the Vikings were in nearly every game, and with all five starters and eight lettermen overall returning for longtime head coach Bill Brown, the sky is the limit for the green and gold this year. The Vikings will be led by one of the conference’s top inside-out combos in senior guard Autry Acord and 6’8” senior big man Zach Cameron. Fellow seniors Jake Brown, Connor Ratliff, and J.T. Thompson round out the returning starters. Senior Javahn Rollins and a deep junior class will provide depth. GLENDALE—In head coach Brian McTague’s first year at the helm, the Falcons finished with a 15-11 overall record, yet posted a 7-2 mark in the conference, which was good for third-place. Now with a full year of experience in McTague’s system, look for four Falcon seniors to lead Glendale to new heights, as Chandler Collins, Jesse Harbour, Garrett Skipworth, and Ryan Wester eye a strong finish to their Falcon careers. 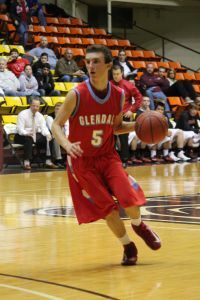 Glendale lost just one starter, but it was a really good one in 2nd-Team All-State Missouri State signee Cameron Maes. Watch out for incoming freshmen Monty Johal and Jordan Walton, who should contribute immediately for the Falcons. WEST PLAINS—Four starters are back for West Plains, as the Zizzers look to take the next step following a 16-12 overall effort and 5-4 record in conference play. Four losses last season were by three points or less, which means the Zizzers could easily have been a 20-win team a year ago. West Plains returns its top four scorers and top two rebounders. There is a trio of double figure scorers returning in Zach Flippin, Justin Davis, and Chase Riley. HILLCREST—First-year head coach Tomas Brock inherits a team that finished at 18-9 a year ago, including a third-place conference finish at 7-2. Senior Brady Petry is one of the best in the area, and will need to bare the scoring load until a fresh batch of young Hornets get their feet wet. Hillcrest will also get key contributions from senior Jordan Griffith and sophomore Shahn Clark, while a host of newcomers to the program will get every chance to contribute immediately. ROLLA—A really young team struggled with consistency last year, finishing with a 15-11 record. Ten players return who saw action a year ago, including four starters in seniors Caleb Copeland and Carter Wands, and juniors Sam Marshall and Kobe Wands. Senior Shane O’Brennan and junior Sam Marshall also saw significant action last year. The Bulldogs drop to Class 4 for the first time in forever, but must battle last year’s state runner-up Helias in District 10. JOPLIN—First-year head coach Jeff Hafer returns to his alma mater to lead an Eagle team that finished 12-13 a year ago, including 2-7 in the conference. The Eagles lost four seniors to graduation, including an All-State selection in Charlie Brown. According to Hafer, the Eagles “will play an up tempo, tough and physical brand of basketball that kids love to play and fans love to watch.” Five seniors will lead the way in Jace Braker, Carlos Santillian, Delshaun Garth, Skyler Duley, and Austin Zengel. LEBANON—The ‘Jackets posted a 10-17 overall record, which included a winless effort in the rugged Ozark Conference. Lebanon, which returns four starters, will be led by a pair of All-Conference selections in junior Connor Hicks and sophomore Jack Ehrhardt, as well as a pair of 6’4” senior twin towers in Caleb McGinnis and Chad Howerton. CAMDENTON—The Lakers had a winning season overall a year ago (15-13), but struggled in conference with just one victory. Camdenton’s season ended with a 60-59 overtime loss to eventual Class 4 state runner-up Helias in the district semifinals. The Lakers want to carry over that momentum to this season, but did lose six seniors to graduation. The lone returning starter is senior guard Jordan Knight. Other returning lettermen are ready to take on a more prominent role, and include seniors Jake Decker, Tristan Starkey, and Alex Amerine, and junior Michael Hake. Autry Acord, Parkview—A 1st-Team All-Conference selection last season, Acord is a scoring machine who averaged 18 points per contest, as well as 3.7 rebounds, 3.1 assists, and 3.8 steals per game. The senior guard is a smart player who acts as a coach on the floor for longtime Viking head coach Bill Brown. Tyson Batiste, Kickapoo—Batiste will be playing his fourth season of varsity basketball this winter, before heading off to pay Division I basketball at Arkansas-Little Rock. The 6’3” senior guard led the Chiefs in both rebounding (6.2) and assists (5.2) last year, and recorded three triple doubles. Batiste, a 1st-Team All-Conference and All-District honoree who averaged 9.1 points, will play a key role this season for a team that has state championship aspirations. Zach Cameron, Parkview—It seems like Parkview always has a talented post player, and Cameron is the next in a long line of Viking big men. The honorable mention All-Conference selection averaged 14 points, 7.1 rebounds and three blocks per game a year ago, and passes well for a big man. Cameron can also step out and knock down a midrange jump shot. The 6’9” Cameron is a Missouri State commit who also garnered 1st-Team All-District honors. Chandler Collins, Glendale—A 6’4” bruiser, Collins averaged a double-double the last half of the season a year ago after a slow start. The senior, who posted averages of 7.6 points and 6.6 rebounds for the year, will be a double-double threat night in and night out for the Falcons. Justin Davis, West Plains—Davis is an opposing coach’s worst nightmare, a 6’3” slasher who is one of the best outside shooters in the area (66 three-pointers for the season), but who can also get to the rim seemingly at will. The senior forward averaged 15 points and 7.1 boards per game, en route to honorable mention All-Ozark Conference honors. The inside-out threat also earned 1st-Team All-District honors. 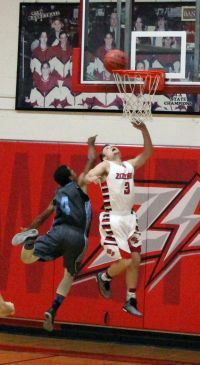 Zach Flippin, West Plains—A four-year starter at point guard for the Zizzers, Flippin led West Plains in scoring at 15 points per game. The senior is an excellent ball handler who sees the floor well and has a scorer’s mentality, yet was one of the area leaders in assists at six per outing. The 1st-Team All-Conference and All-District selection teams with Justin Davis to give West Plains one of the conference’s best scoring duos. Darrian Guillory, Joplin—Guillory averaged 16 points, six rebounds and two assists per game while playing in the COC-Large for Neosho last year. The 6’4” junior transfer will be a major contributor on both ends of the floor for the Eagles, and should establish himself as one of the conference’s best post players. Juwan Morgan, Waynesville—The reigning Ozark Conference Player of the Year will be in the hunt for Missouri Mr. Basketball honors this season. Morgan, who has already committed to play basketball collegiately at tradition-rich Indiana, was a 1st-Team All-State honoree by both the coaches and media last year. Morgan will attract double (and triple) teams all season, as opponents look for ways to stop (or at least contain) the talented post player who averaged a double-double for the Tigers last year (19 ppg, 10 rpg). Brady Petry, Hillcrest—The Hornets have been one of the most consistently successful programs over the past several years, and Petry has been a main contributor for the last three. The 6’4” senior averaged 19.5 points, 5.3 rebounds, 2.1 assists, and 2.3 steals per game last year, which netted him 1st-Team All-Conference and All-District accolades. Petry led the Hornets in scoring and rebounding last season, and hit 60 three-pointers for the year. Petry will need to be at his best this year to lead a young team playing its first season under new head coach Tomas Brock. Jack Simpson, Kickapoo—Another four-year varsity player for Kickapoo, Simpson is not afraid to do the dirty work for the Chiefs. Simpson, a 5’10” starting linebacker for the Chiefs’ football team, is tough as nails and a pesky, on-the-ball defender who gives opponents fits. The 1st-Team All-Conference senior averaged 11.4 points per game, and has a reliable outside shot. Look for the hard-nosed linebacker and lock down defender to be harassing opposing ball handlers all throughout Kickapoo’s season, which the Chiefs have plans on finishing in Columbia. 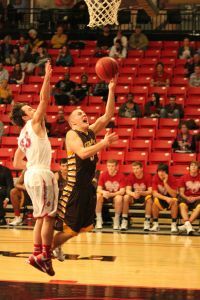 Ryan Burland, Kickapoo—Burland was an honorable mention All-Conference honoree last year after averaging six points and five rebounds per contest. The 6’6” senior forward is a great rebounder, and has the skills of a guard in a big man’s body. Caleb Copeland, Rolla—Despite missing a good portion of the Ozark Conference schedule last season, Copeland still earned honorable mention All-Conference recognition. The 6’4” senior forward is strong and physical and can get to the rim, but is equally adept at draining a pull-up jumper. Copeland, who led the Bulldogs in scoring and rebounding a year ago, creates match-up problems for opponents with his size and versatility. Jack Ehrhardt, Lebanon—The only freshman to receive All-Conference recognition last year, Ehrhardt averaged 10 points per game for the ‘Jackets. The 6’1” sophomore guard had a standout summer, and is ready to take his game to another level this winter. Connor Hicks, Lebanon—Ehrhardt’s backcourt mate, the 5’8” Hicks also had a breakout summer, and is ready to shine for Lebanon this year. Hicks, an honorable mention All-Ozark Conference and 1st-Team All-District selection, averaged 10.4 points, 2.7 rebounds, and 4.7 assists per game as a sophomore. Joe Johnson, Waynesville—All-Everything Juwan Morgan gets all the publicity, but the Waynesville attack goes wherever Johnson leads it. An honorable mention All-Conference selection last year, the 5’10” junior guard is a great outside shooter with unlimited range. Johnson, who has started since his freshman year, will play a major role in how far the state-ranked Tigers advance in March. Jordan Knight, Camdenton—A 6’1” senior guard, Knight is the lone returning starter for the Lakers. Knight averaged nine points per game as a junior, but should increase that average significantly this season. Knight had a strong summer and is ready to step into a more prominent role for Camdenton in his final season in a Laker uniform. Matthew Ridder, Kickapoo—A three-year varsity player, Ridder will vie for 1st-Team All-Conference honors after receiving honorable mention recognition last season. The 6’1” Ridder averaged 12 points per game and hit 41% of his shots from outside the arc as a junior. The sharpshooting senior, who hit 74 three-pointers last year, is open when he leaves the locker room, and set a Blue & Gold Tournament record with 19 three-pointers in a four-game stretch last December. Garrett Skipworth, Glendale—Head coach Brian McTague needs a solid point guard to run his attack, and he has a really good one in Skipworth. The six-foot senior point guard averaged 12.7 points and dished out 5.7 assists per game last year, and is poised for an even better senior season as the Falcons’ on-court leader. Kobe Wands, Rolla—A two-year starter at point guard for the Bulldogs last year, Wands was an honorable mention All-Conference selection. 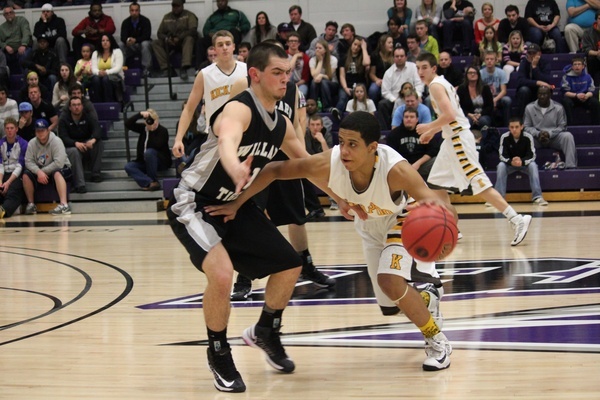 The 5’10” junior was one of the Bulldogs’ team leaders in scoring, assists, and steals. Ryan Wester, Glendale—A two-year starter at Fordland, Wester transferred to Glendale and averaged 11.5 points and 6.2 rebounds last year in his first season in a Falcon uniform. Wester should vie for 1st-Team All-Conference honors this season after getting acclimated to the OC a year ago. (19) Webb City at Joplin—The Eagles welcome in their nearby rival for Joplin’s first game in its new school and gymnasium. It will be Joplin’s first “home” game since the school and gymnasium were destroyed by an EF-5 tornado on May 22, 2011. There may not be a more important game on any schedule in the state this year! (19-20) Route 66 Shootout at Waynesville—This annual two-day hoopfest has some intriguing match-ups, as usual, for Ozark Conference (and statewide) fans. Friday’s slate of six games features Parkview v. Class 5 #5 McCluer North and Class 5 #7 Waynesville v. Class 4 #5 Lafayette (St. Joseph). On Saturday, the Tigers will face Hazelwood Central as part of another six-game schedule. (26-30) Blue & Gold Tournament—Camdenton, Glendale, Lebanon and West Plains will represent the Ozark Conference in the annual four-day holiday extravaganza. Other teams participating include: Aurora, Ava, Bolivar, Branson, Buffalo, Central, Clever, Conway, Crane, Fair Grove, Greenwood, Hartville, Hollister, Logan-Rogersville, Mansfield, Marion C. Early, Marshfield, Mt. Vernon, Mountain Gove, Nixa, Ozark, Reeds Spring, Republic, Skyline, Spokane, Strafford, Willard, and Willow Springs. (26-30) Coaches v. Cancer Holiday Tournament—This annual holiday tourney played at St. Louis Community College features a loaded field that includes Class 5 #3 Kickapoo and #4 Webster Groves, as well as the top-ranked team in Class 4 in St. Charles. The rest of the 16-team field includes Confluence Prep, DeSmet, Eureka, Hazelwood Central, Jennings, Kirkwood, Lafayette (Wildwood), Lindbergh, Marquette, Parkway West, Soldan International, Troy Buchanan, and Vianney. (2) Hillcrest at Glendale—Hillcrest’s Brady Petry has played as well as anyone early on this season, while the Falcons have shown they are a much-improved team from a year ago. Both the Falcons and Hornets will want a victory in the conference opener for both teams. (6) Ozark at Parkview—The Vikings will face a very talented Ozark squad that has designs on winning a COC-Large championship. The Tigers were also just handed a top seed in the Blue & Gold Tournament. The game should provide Parkview with a challenging match-up before entering Ozark Conference play. (9) Kickapoo at West Plains—The Chiefs are loaded up for an unbeaten run through the Ozark Conference. First up are the Zizzers, who have the offensive firepower to hang with Kickapoo…especially at home. However, Kickapoo may have its deepest team ever, which is saying a lot for the tradition-rich Chiefs. (15-17) Bass Pro Tournament of Champions—Widely regarded as one of the best boys basketball tournaments in the entire country, this year’s slate of eight teams figures to put on another great show for Ozark basketball fans, who have made the TOC the most attended high school basketball tournament in the nation. In addition to local (and Ozark Conference) teams Waynesville and Parkview, the rest of the slate includes four teams nationally-ranked by USA Today in High Point (N.C.) Wesleyan Christian (#2), perennial national powerhouse Oak Hill Academy (#3), Bishop O’Dowd out of Oakland (Cal.) (#12), and former TOC champ Paul VI (#23) out of Fairfax, Vir. In addition Chino Hills (Cal.) and Bentonville (Ark.) are in the field. (20) #3 Kickapoo at Nixa—This may be one of the most anticipated match-ups of the season, due in large part to the success these two programs have enjoyed over the years. District realignment took Nixa out of District 11 and into District 12, so there will not be another district meeting between the Eagles and Chiefs, as there have been the past three seasons. These two split the last two district championship games. This could be a preview of a Class 5 Sectional thriller. (20) West Plains at Parkview—A key Ozark Conference game for a couple of teams thinking big things this season, the game also features a match-up of two of the conference’s best guards in the Zizzers’ Zach Flippin and Parkview’s Autry Acord. (29-31) Nixa Invitational Tournament—Hillcrest will represent the Ozark Conference at the annual Nixa tourney, which also features the host Eagles, Class 3 #4 Eugene, Class 1 #7 Walnut Grove, Mount Vernon, Harrisonville, and Winnetonka. (30) Parkview at Kickapoo—The Vikings have lost two-straight in this city rivalry. The state-ranked Chiefs are one of the state’s best teams, but can Kickapoo handle Parkview’s rough and tumble, slow-it-down style? Kickapoo will travel to Lee’s Summit the following night for a huge game with the state-ranked Tigers. Will the Chiefs be looking ahead? (31) #3 Kickapoo at #10 Lee’s Summit—The Chiefs hit the road for a huge non-conference game against the tenth-ranked Tigers just one night after a big rivalry game against Parkview. Will the Chiefs’ emotional tank be on empty? That’s not likely going to be a problem for the senior-laden Chiefs. (10) Glendale at Kickapoo—This rivalry game has gotten so big that it’s been played at the O’Reilly Family Events Center at Drury the past few years, and this year will be no different. As the old adage goes, you can throw the records out when the Falcons and Chiefs get together. These two split a pair of matchups last year, with Glendale winning the regular season game 61-52, while Kickapoo won a 47-45 squeaker in the district semifinals. (12) Hillcrest at Central—This Springfield Public Schools match-up should be a dandy, with Brady Petry and company venturing into The Pit to face the Bulldogs, who are playing inspired basketball for head coach Armando Johnson. A great place to watch a high school basketball game! (20) #7 Waynesville at #3 Kickapoo—Do fans really have to wait until Feb. 20 for this game?!? The Tigers feature the best player in the conference, the area, and maybe even the state in 6’8” senior Juwan Morgan, but the Chiefs have a balanced team that is eyeing a deep state tourney run in March. These two shared an Ozark Conference championship last year, despite the Chiefs’ 57-56 road win over the Tigers. (27) Hickman at #3 Kickapoo—This is a great opportunity to see the state’s best player in person—before he leaves the state to play at the University of Arkansas. The Kewpies feature 6’4” shooting guard Jimmy Whitt, considered by the major recruiting services to be the best player in the entire state. Whitt, who signed with the Razorbacks last month, averaged 22.4 points for last year’s Class 5 state runner-up.